When a liquidity and credit crunch emerged in the summer of 2007, Mr. Bernanke engineered a U-turn in Fed policy that prevented the crisis from turning into a near depression….The federal funds rate was effectively pushed down to zero….New programs encouraged skittish institutions to resume lending….Mr. 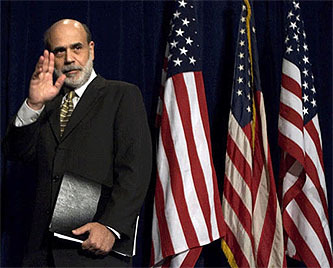 Bernanke also introduced a wide range of other programs, like those to maintain the functioning of the commercial paper market….The Fed was involved directly in the rescue of financial institutions like Bear Stearns and American International Group. It lent money to foreign central banks to ease a global shortage of dollars. The Fed even committed to purchasing up to $1.7 trillion of Treasury bonds, mortgage-backed securities and agency debt to reduce market rates. The Fed’s creative and aggressive actions have significantly reduced the risks of a near depression. For this reason alone Mr. Bernanke deserves to be reappointed so that he can manage the Fed’s exit from its most radical economic intervention since its creation in 1913. Hmmm. Bernanke’s background and temperament did indeed make him well suited to address this crisis once it unraveled. However, Roubini admits that back in more normal times Bernanke’s actions also played a role in helping to create this crisis in the first place. We’re now — hopefully — about to head back into more normal times. So does it really follow that just because Bernanke turned out to be a good crisis manager, he’s also the best bet to head up the Fed during the mopping up stages? I’m not sure I see that. Unwinding Bernanke’s programs doesn’t require Bernanke at the helm, and the job of re-envisioning the role of the post-collapse Fed would be better off in the hands of someone who’s taken bubbles seriously all along. It’s possible, of course, that Bernanke has gotten religion on this point, but I’d rather not chance it. Why not choose someone instead whose views on credit bubbles are clear, consistent, and long held? Someone who correctly assessed the situation before it blew up and can be trusted to do the right thing now even if he or she has to face down the financial industry to make it happen? I don’t think reappointing Bernanke would be any kind of disaster, but I also doubt that it would be the best choice. The Fed needs a change of direction, not more of the same. POSTSCRIPT: But what about Bernanke’s recent charm offensive? Consider me charmed! I applaud the idea of a Fed chairman willing to talk to the press and answer questions in fairly plain language. It’s a change for the better. But it’s still not enough to make me think Bernanke ought to be reappointed.